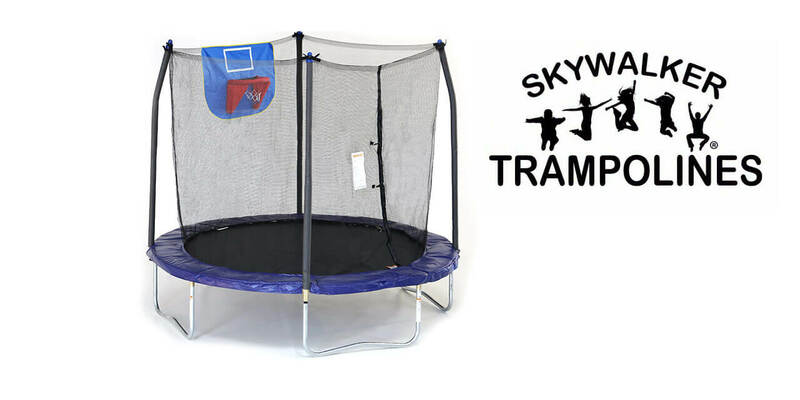 Skywalker 8 ft. trampoline is a trampoline made exclusively for children. 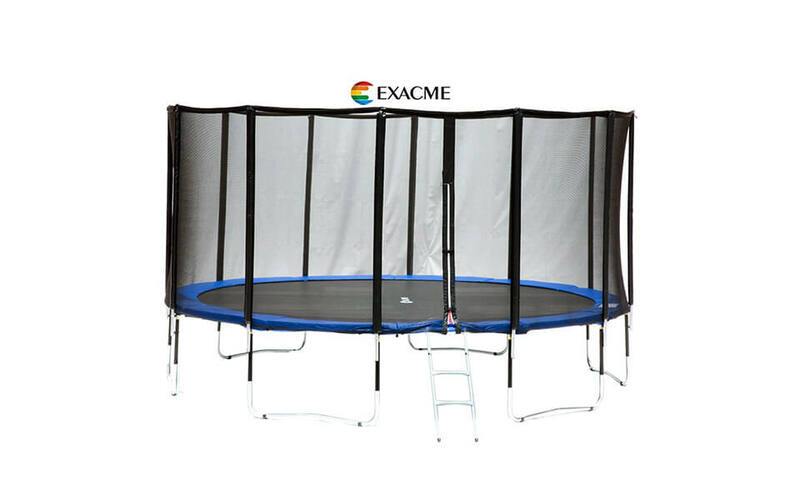 As it is only 8 foot in diameter it can be used as either outdoor or indoor trampoline, but only if there is enough space around and over trampoline. As this trampoline has same features as it`s bigger brothers – Skywalker 12 ft or 15 ft trampoline, we are more than certain that this, 8 ft. model, will show consistency of Skywalker`s manufacturing process quality. 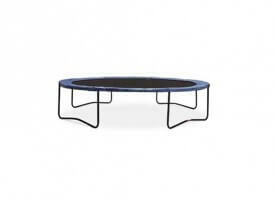 This small trampoline is small trampoline but with great specifications. Good quality parts, decent price and possibility to make it indoor or outdoor brought this trampoline to the top of best-selling 8 ft. trampolines. Only problems you might have is same as will all Skywalker trampolines – occasional problems with shipping packaging, meaning that quality control could be better. But, latest reports did confirm that Skywalker improved it and that packaging problems have been decreased to minimum. We would like to think this is true as Skywalker trampolines really don`t deserve rating decrease over such resolvable issues. 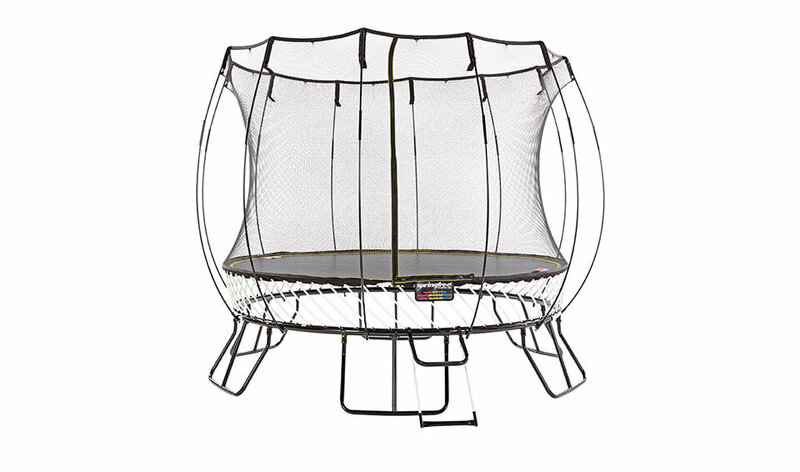 Frame is made from 16-gauge pre-galvanized steel and thanks to 4 W-shaped legs and T-sockets to connect them to frame offers outstanding sturdiness when compared to other 8 ft. trampolines. We have to mention that trampoline is much more sturdy than bigger SkyWalker trampolines. There are 56 springs which are connected to mat via V-ring. Standard Skywalker mat with 4-stitches, made from PolyPropylene. Mat disappointed us as overall bounce quality could be better. Available in two different colors – blue and green. Like on all Skywalker models pad color dictates overall trampoline price so check out different options if you are buying this trampoline. Price can really fluctuate between those two colors. Padding is wide enough to cover frame & springs, and made of soft foam with PVC outer coating. Pad itself is connected to V-rings and frame using straps. 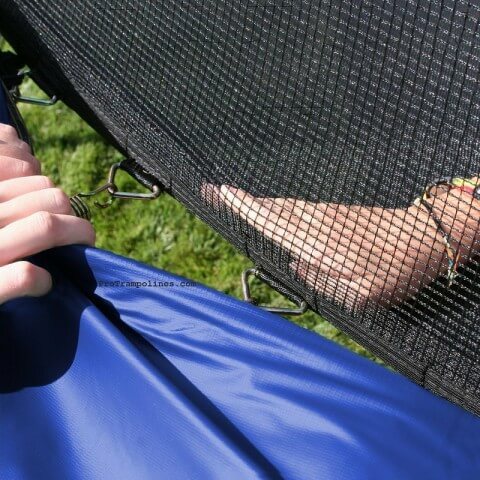 Safety enclosure on Skywalker 8 foot trampoline is connected directly to mat V-rings, eliminating possibility to accidentally hit springs or frame. This kind of “gap-free” enclosure design greatly improves safety but limits available jumping room. Enclosure is supported via 5 steel support poles, also padded for protection. Assembled dimension are 8 ft x 8 ft x 6.5 ft with height of frame only 21-inches, making it easy accessible even without trampoline ladder. Because of the size, assembly can be completed in an hour by one person only. Never the less, we encourage you to read owners manual prior installment procedure. Warranty is like on all other Skywalker models – 1 year on frame and 90 days of limited warranty on all other parts. Make sure to check newest addition – Skywalker 8ft Trampoline with included safety enclosure and basketball hoop! 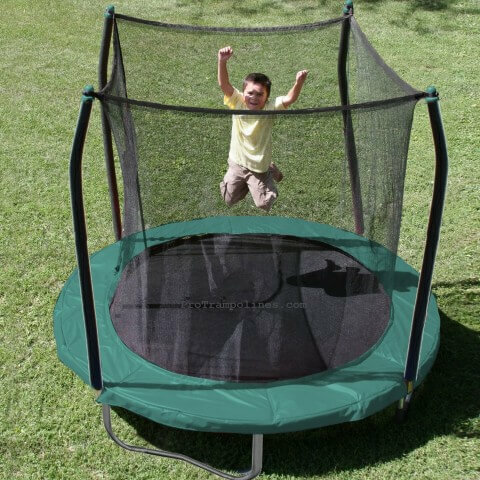 Good and affordable trampoline which you should consider if you are limited by space or by funds. Can be used as entry model for youngsters!